Ptosis, also known as droopy eyelid, is the abnormally low position of your upper eyelid. Sometimes referred to as a 'lazy eye' (amblyopia), it can affect one or both eyes. Droopy eyelids can be hardly noticeable or they can completely cover the pupil, iris and other parts of the eye. If severe or left untreated, the droopy eyelid can lead to other conditions such as amblyopia or astigmatism. Interfering with vision, peripheral vision and functions such as reading, droopy eyelids can lead to headaches or brow aches from straining to elevate the eyelids. It's very important that the disorder is treated as soon as possible, especially in children, before it begins to interfere with one's vision fields and vision developments. Ptosis can affect people of all ages and is not more common in one age group versus another, although it is known to be brought on as age progresses. 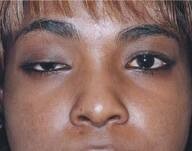 The most obvious symptom of ptosis is the drooping eyelid itself. Other symptoms include difficulty shutting or opening the eye, extra skin on or around the eyelid, or the need to tilt your head back in order to see better. Additionally, eye fatigue, crossed, misaligned eyes or double vision can also be attributed to ptosis. Many experts recommend that you compare of photo of yourself from 10 years ago to one now to see if there is a difference in your eyelid skin. If there is, there's a great chance you are suffering from ptosis. The diversity in the causes of droopy eyelid is great. One can be born with droopy eyelids, also known as congenital ptosis, gaining it through hereditary. Other times, as we age and our muscles deteriorate, ptosis develops. Droopy eyelids can also be caused by trauma or damage to the muscles that raise the eyelids or the nerves that control this muscle. Besides aging, the most common cause of droopy eyelids is the improper development of the levator muscle. The levator muscle is the major muscle responsible for elevating the upper eyelid. Sometimes, it can be the result after eye surgery or cataract, while other times eye tumors, neurological disorders or systemic diseases like diabetes may result in the ptosis. The best kind of treatment for a droopy eyelid is surgery, called blepharoplasty. The surgeon will go in and tighten up your levator muscles, lifting your eyelids, giving you improved vision and appearance. If your levator muscles are too weak to withstand a normal surgery, your surgeon may want to attach your eyelid under your eyebrow, allowing the forehead muscles to replace the levator muscles when lifting the eyelid. In most cases, after surgery there is no reported loss of movement within the eyelids. Although they may not look symmetrical, the eyelids are higher than before the surgery took place. It's important to know that ptosis does not fix itself over time. In fact, the opposite happens as it gradually worsens. The only way to truly fix the problem is with surgery. Choosing a surgeon or finding an eye doctor can be a tedious process, especially if friends or family can not assist in referrals. It's important that you ask to see before and after photos of your surgeon's previous procedures, to ensure yourself you are choosing the correct doctor, such as an ophthalmologist specializing in plastic and reconstructive surgery. Ptosis can already make you feel unattractive, so if your surgeon is not skilled or trained in doing this critical procedure, your appearance can worsen, or worse, lead you to future corrective procedures.